This book is actually a companion to the exhibition that was held at the Complesso de Vittoriano in Rome, Italy. Alphonso Mucha is probably very well known for the Art Nouveau movement, and his beautiful illustrations of women. 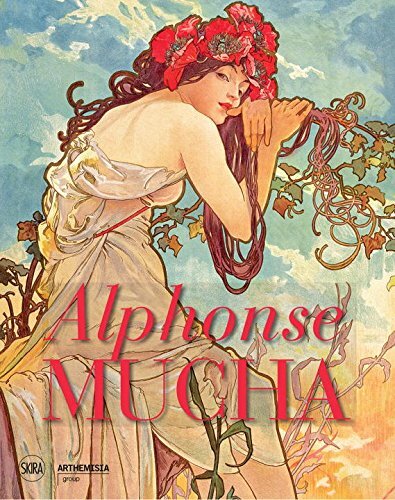 What I did not know, and explained in this book, was Mucha was also into book illustrations, sculpture and even photography. He has designed jewellery, and has his work appeared on merchandise such as perfume bottles, tins, cutlery, stamps, ornaments and even designed the bank notes of Czech Republic. This book has a detailed history about Mucha's life and career. It talks about his inspiration, where he has been, and of course his masterpieces. The artworks in this 248-page hardcover are printed big. There are the lovely Mucha women, paintings of the war, The Slav Epic (a project to enlighten Slavs about their own history), sketches, and some commercial work. The selection of art in this book is fantastic. I was pleasantly surprised by his other styles. I've always been captivated by his women illustrations with intricate backgrounds but he can actually paint and draw in many other styles. This book definitely helped me learn new things about Mucha. This is quite an inspiring book. Highly recommended.